Hoverfly Technologies Becomes First AMAG Technology Certified Drone Partner | Company Newsroom of Hoverfly Technologies, Inc.
Hoverfly tether-powered drones now seamlessly integrate with thousands of security monitoring installations around the world. ORLANDO, Fla., February 22, 2018	(Newswire.com) - Hoverfly Technologies, Inc., America’s leading tether-powered drone manufacturer is pleased to announce its partnership with AMAG Technology, the leading global security integration company. Hoverfly is the first drone company to receive AMAG Technology Certification, allowing Hoverfly drones to seamlessly integrate and interface with thousands of security monitoring installations that use AMAG Technology products around the world. Since 2010, Hoverfly Technologies has manufactured easy-to-use, tether-powered drones that fly all day and get the job done for public safety, law enforcement, and security operations professionals who need immediate aerial awareness during critical situations. The addition of AMAG Technology as the world’s premier integration partner means Hoverfly customers will not have issues incorporating Hoverfly’s meta-data, video, and information into their current security operations center. Hoverfly Technology drones are uniquely manufactured with persistent power from a 200-foot tether allowing critical security missions to continue for hours, days or weeks, eliminating short flights and battery-changing interruptions. 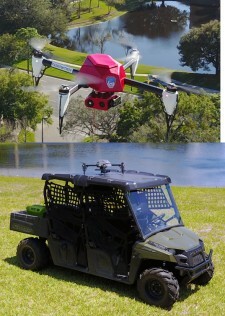 Hoverfly Technologies Inc. (www.hoverflytech.com) designs and manufactures tether-powered aerial drones designed for persistent security and public safety applications. Our drones operate in defense, security, public safety, sports, media, and large industrial markets where reliability and durability are paramount. Hoverfly drones fly continuously for hours, days and weeks at a time using mobile/ground power transmitted over the tether. Hoverfly drones send RF secure data and operate from fixed base installations or “on the move” vehicles. Our products fly autonomously and require no piloting skills, making them practical for all types of users, applications, and missions. Our customers equip their drones with a variety of payloads including video, IR cameras, communication detectors, transmitters, lights and more. Hoverfly drones are designed, built and supported in the U.S.A.
AMAG Technology’s Symmetry™ Security Management Solutions are deployed across a wide variety of market segments from commercial to government, education, healthcare, banking, transportation, utilities, plus many more. Headquartered in Torrance, California with sales and support located throughout the Americas, EMEA, APAC, and LATAM, AMAG provides customers with industry-leading unified security solutions. AMAG Technology is part of G4S plc, the world’s leading global integrated security company which has operations on six continents and 585,000 employees. As the industry leader, AMAG focuses on delivering the latest technology to meet market needs.